One of Disney's very best with amazing views of the Magic Kingdom® Park and the Seven Seas Lagoon. Some of the best sushi in the area. Kids love this character meal with Mickey and the gang. Very popular so make reservations early. Ask for a window table with a view of the castle. Fun for the family. Ask for a window seat with distant views of the Magic Kingdom® Park. Featuring regional, organic, and sustainable offerings. Delicious cuisine with an African flair and one of the largest South African wine lists in the U.S.
New England comfort food and classic seafood dishes at Disney's Yacht Club Resort. Breakfast, lunch, and dinner; casual dress. Open daily 7:30-11:00 a.m., 11:30 a.m.-2 p.m. and 5-9 p.m.
American cuisine at Disney’s Beach Club Resort. Lunch and dinner; park casual dress. 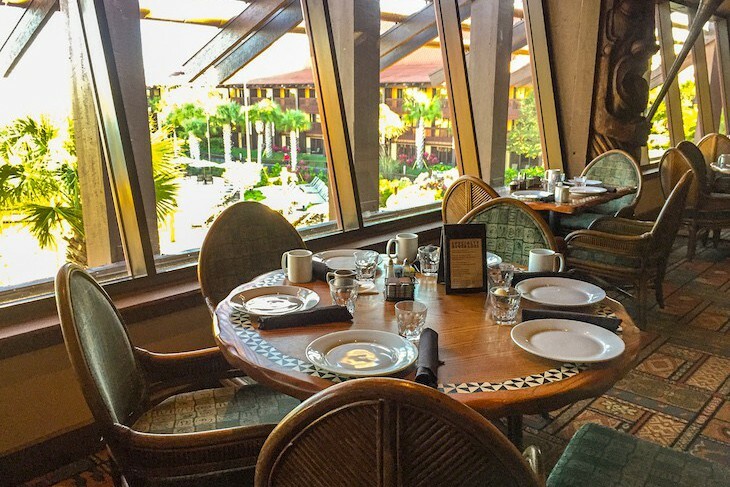 Open daily 11 a.m.-11 p.m.
African cuisine at Disney's Animal Kingdom Lodge. Breakfast and dinner; casual dress. Open daily 7:30-11 a.m. and 4:30-9:30 p.m. Steaks at the Waldorf Astoria Orlando. Dinner only; smart casual dress. Open daily 6:00-10:00 p.m.
Wow, has this restaurant evolved since it’s opening, one of Orlando's very best. Not surprisingly, the décor at the Waldorf Astoria’s signature restaurant is old world and pretty sensational. From the dark mahogany and rich leather banquettes to the starched white tablecloths, gleaming goblets, and stellar service, it’s sure to please if atmosphere is what you are seeking. A stylish and roomy bar is the place to begin where fine wine and high-end cocktails are de rigueur. Move on to the restaurant proper for dazzling presentation and food. Begin with the Pasta Explosion, soft pockets of pasta filled with Pata Negra de Bellota ham and Parmigianno Reggiano. It’s essential to eat each in one bite and not to be cut, thus the explosion. An heirloom tomato salad is also great choice with wedges of golden tomatoes and burrata cheese sprinkled with baby arugula, crispy basil, and aged balsamic. A dish of roasted Colorado lamb, cooked in a tagine with North African spices, is reminiscent of a cassoulet but made smoky with Jamon Serrano in a chocolate-colored sauce atop a bed of Beluga lentils. Steakhouse traditionalists shouldn’t resist the Tomahawk, a 36 ounce beauty, dry-aged 32 days, perfectly cooked, and sliced tableside; to add excitement to perfection, four sauces are served along with the cut: peppercorn cognac, roasted shallot bordelaise, béarnaise, and Bull and Bear steak sauce. In true Waldorf fashion there’s something for everyone, and although it is a steakhouse, non-red meat options certainly do not disappoint. Undoubtedly the most dramatic dish in all of Orlando is a whole Maine lobster hanging from a spit, rolled out on a cart, and flambéed tableside. Below the lobster sits crusty bread that absorbs all the butter and liqueur as it drips off the lit lobster, almost a caramelized taste and actually one of the best aspects of the entire dish. Don’t worry about it being too much work . . . your waiter will shell and segment it for you so all you need do is enjoy. And better yet the side of potatoe pave is to die for, a not terribly rich, beautifully layered au gratin style square. Or go for the “fried chicken”, brined for twelve hours, then sous-vide, finished with a double crisping, served with a tiny copper pot of gravy and a Le Creuset pot of puréed potatoes, all carved and plated tableside. You’ve never tasted chicken so tender and so delicious. If you’re really feeling decadent order the side of macaroni and cheese with pancetta, or better yet the Bull & Bear frittes, soaked in malt vinegar for 24 hours, double fried, then finished with beef tallow and served with a sides of organic ketchup and garlic aioli. I still have dreams about the hot beignets with bourbon-caramel, chocolate, and vanilla dipping sauces. Or go with one of the chocolate “cigars”, rich dark chocolate wrapped in phyllo and made to exactly resemble a big, edible stogie right down to the cigar band, served in a glass ashtray with “ash”. New American cuisine at Disney’s Contemporary Resort. Dinner only; resort casual dress. Open nightly 5 to 10:00 p.m.; lounge open 5:30 to 11:30 p.m.
Over the course of almost two decades California Grill has attained cult status and is consistently one of the toughest tickets in the “World” to obtain reservations. Here my favorite things are all in one place: a super wine list, outstanding cuisine, striking décor, and fabulous views. The drop-dead-gorgeous setting on the 15th floor of the Contemporary Resort enjoys Disney’s best—period. 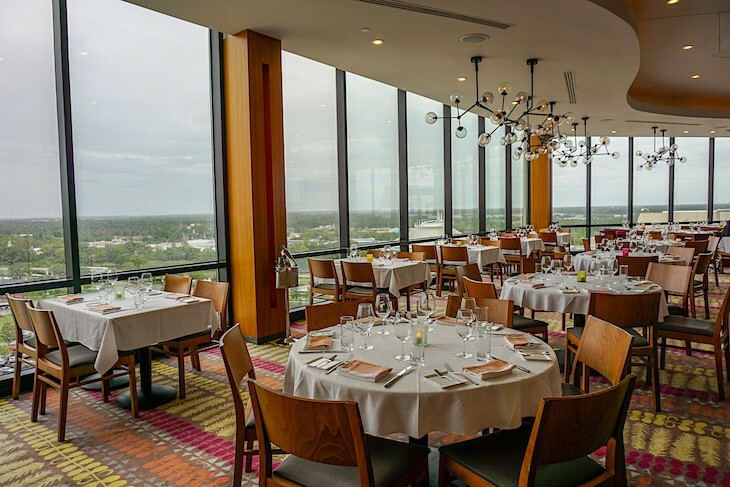 From its lofty heights diners can see the Magic Kingdom, the sparkling Seven Seas Lagoon, and, best of all, the Wishes fireworks. An inventive approach to seasonally focused food goes along with the restaurant’s coveted position. White walls mix with warm fabrics and carpeting in sunset colors of yellow, red, and orange, and the massive picture windows are perfect for peering out at that spectacular view. Windows are floor to ceiling with virtually no interruption except for minimal framing. Upon entering the restaurant you are greeted by a massive cabinet featuring 1,600 bottles of mostly California wine. Offering everything from boutique wines to those of South Africa or Oregon, there is absolutely something for everyone. If your table isn’t yet ready on arrival nab a seat in the lounge area or at the bar where some of the best views are to be had. Begin with the dangerously delicious lavender focaccia served with a salty slab of butter. As for appetizers, you can never go wrong with the Sonoma goat cheese ravioli, one of my absolute favorite appetizers ever, thin-thin pasta in a pool of tomato-fennel broth and slivers of fresh basil. Or the seasonal variation of lobster bisque; one visit it came with hints of squash, pumpkin, and lemon crème fraiche, not heavy or overly rich which is always my preference. The ever-present grilled pork tenderloin, perfectly pink in the center with a zinfandel glaze accompanied by renowned goat cheese polenta (if you’re smart you’ll order a side of the polenta for the table to leave plenty for yourself and it comes with a bonus of a few sprigs of crispy sage on top) has always been a favorite. The oak-fired, actually a bit charred on the outside, filet with seasonal risotto (I’ve tried it with heirloom tomato risotto, made with tomato juice instead of the normal chicken stock, and also a nice sweet corn risotto with spring onion oil – both pretty darn perfect) is another highlight of the stellar menu. Sushi lovers take note that the only way to order a the restaurant’s crispy tuna and Jonah crab roll is as an addition to this filet. While great sushi and sashimi might be the last thing one would expect at Walt Disney World, here only the best is served along with ten varieties of sake. But while the spicy Kazan roll is a favorite I find it so strange with a huge amount of mayonnaise-based Fireball Sauce smothering the entire plate and totally overwhelming the taste of the rolls filled with a variety of seafood. Procuring a window seat here can be tough but don’t be discouraged; time your meal around the fireworks and head outside to not one but two super observation platforms for a bird’s-eye view of the extravaganza. Brunch at the Top is now offered on Sundays. Cara's Tip: Reservations here go quickly so plan ahead. Check-in is on the second floor where you’ll then be escorted upstairs. 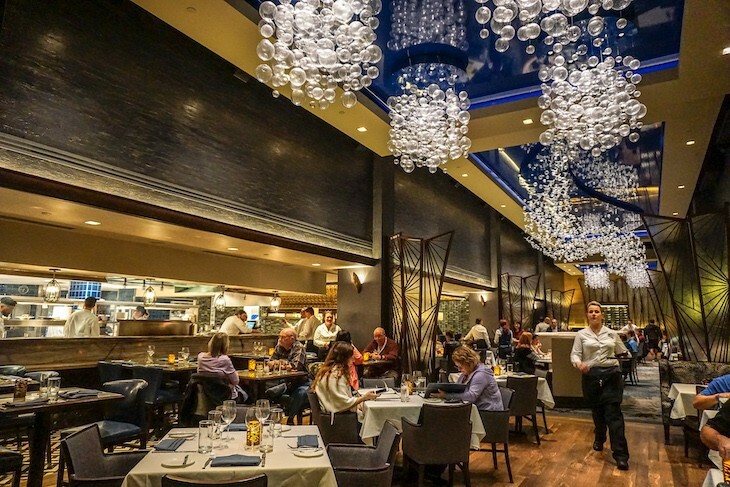 Spanish-influenced steakhouse at Four Seasons Resort Orlando at Walt Disney World Resort. Dinner only; smart casual dress. Open nightly 6:00 to 10:00 p.m. Billed as a contemporary Spanish steakhouse, the commendable Capa is one hopping and happening place. Decorated in a palette of black, grey, and crimson, bullfighting is the theme here with displays of matador costumes, and, even an overhead fixture reminiscent of a flowing, ruby red matador cape, covering the length of one dining area. Come early for sunset or stay late for fireworks at the restaurant’s outdoor terrace lounge along with incredible views of the surrounding environs including Cinderella Castle and Spaceship Earth from the resort's 17th floor rooftop perch. One thing . . . even though it’s on Disney property, don’t even think of showing up in park clothes; dress here is definitely ratcheted up a notch from most of the other resort restaurants. On offer are a variety of small plates, somewhat larger raciones, as well as main courses, all influenced by Basque cuisine and a delight to the senses. It’s difficult to choose from such a nice variety, so try a few and plan on sharing. The cheeseboard is a joy with rich Spanish cheeses, dabs of honey, and dried raisins. The small plate of gambas delights with super thin slivers of red chili scattered over succulent grilled prawns. But the very best of the smaller plates is a tossup between the pimientos stuffed with Spanish chorizo and the lightly fried cauliflower topped with a sous vide egg surrounded by a piquant caper sauce. I would usually say in a case such as this to just come and enjoy some of the best appetizers around and forget an entrée, but if so you wouldn’t have the pleasure of trying the special cut of bone-in Black Angus prime filet, my vote for Orlando’s best steak. Order a side of the chili-spiked broccoli or the obligatory pureed potatoes with brown butter. Let’s also not forget the chicken entree, a breast pounded and rolled then crisped to a golden brown served atop the aforementioned mashers, all drizzled with a divine truffle sauce. End with nothing less than the mini churros with creamy chocolate dipping sauce. A global wine list offers just about something for everyone, but you may want to continue with the restaurant’s theme and order a nice bottle of Rioja or one of the other interesting Spanish choices. Top off the evening by stepping outside to the bar or adjoining terrace for the evening fireworks courtesy of Epcot and the Magic Kingdom. Seaside-themed buffet at Disney’s Beach Club Resort. Breakfast and dinner only. 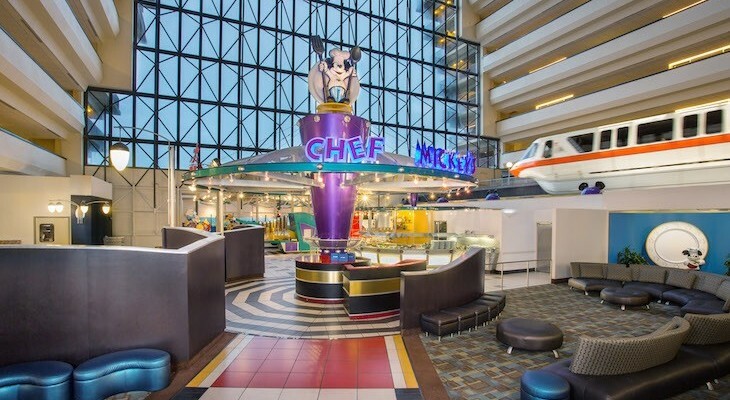 Open daily 7:30-11 a.m. and 5-9 p.m.
American cuisine with a bevy of classic characters at Disney's Contemporary Resort. Breakfast, brunch, and dinner; casual dress. Open daily 7 a.m.-2:30 p.m. and 5-9:30 p.m. Contemporary Mediterranean food at Disney's Grand Floridian Resort & Spa. Dinner only; Resort Casual dress. Open Wed-Sun 5:30-10 p.m.. This restaurant only seems to improve over the years with an ambitious menu that is a delight to the senses, an ultra-friendly staff, and superb management. 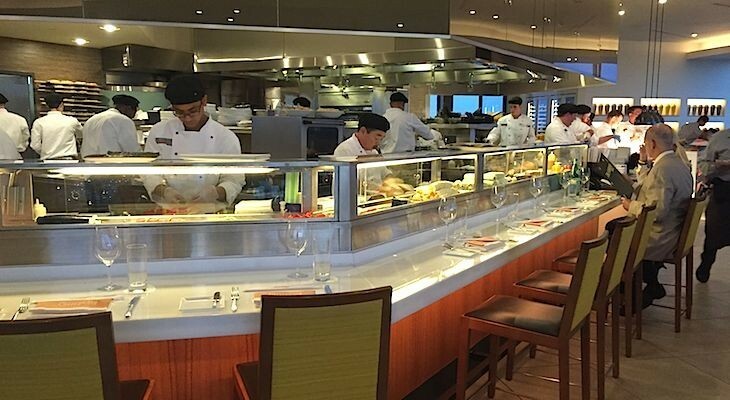 These attributes, combined with an exhibition kitchen where chefs actually walk your entrée to your table and refuse to let you depart without a wave goodnight, makes for one of Disney’s very best places to dine. All is enhanced by starched white linens, rich silk curtains, mosaic tiles, swirling wrought iron railings, and immense windows affording views of the charming resort courtyard and, for just a few tables only, the Magic Kingdom® fireworks in the distance. Almost large enough for an entrée, everyone’s favorite appetizer is the lemony sautéed shrimp peppered with feta and tomatoes; but don’t let its deliciousness allow you to neglect ordering a platter of arancini, crispy fried risotto balls stuffed with smoky tomatoes and mozzarella and served with an herb aioli. Or mull over ordering the superb tomato salad with slices of delicate fresh mozzarella- a variety of perfectly ripened heirlooms, mixed greens tossed lightly in vinaigrette, and a drizzle of aged balsamic tomato emulsion, all sprinkled with toasted garlic “gremolata”. You can't go wrong with the red wine-braised boneless short ribs made even more sinful by the accompanying creamy polenta? Or the oak-grilled filet with an intense red wine demi-glace and standout potato and Vidalia onion gratin—perfection! For a lighter touch there’s Florida red snapper in a bouillabaisse broth, simple but welcome after days of rich dining. Even chicken is exceptional here…organic, pan roasted to a golden brown, served on mascarpone creamed, local Zellwood corn and thick, spring asparagus. Wine lovers are attracted to the extensive list of global vintages including almost 50 by the glass along with iconic, epic wines available by the ounce for tasting. For special occasions The Chef’s Domain, a small private dining room, is available for you and up to eleven family and friends. Here you may either choose from the restaurant’s menu or, better yet, have the chef create a multi-course meal just for you and your group. Seafood at Disney’s Boardwalk Inn. Dinner only; Resort Casual dress. Open daily 5-10 p.m. Flying Fish at Disney’s Boardwalk Entertainment District has a new look that’s hard to resist. Completely transformed, it now exudes a sophisticated and stylish vibe, a stunning reversal from the previous whimsical decor. Deep blue hues abound on the walls, fabric ceilings, and drapery, and, suspended from the enameled ceiling, is an eye-popping school of fish and sea bubble clear glass chandeliers. It’s as if you are below the ocean looking up to the water’s surface, quite reminiscent of the nearby Todd English’s Bluezoo. The menu is still heavily concentrated on seafood, all of it sustainable, the open onstage kitchen is still central to the dining room, but no longer will you find the popular chef’s counter dining. Fans of the lively kitchen area bar will be happy to know that it too was retained and is now quite gorgeous with it’s bronzed fish-scale tile façade. The question is: where to sit? If you like the bustling action of the kitchen then ask for the more casual front area of the restaurant, but if a subdued atmosphere is your style then the back section of the restaurant is much more conducive to quiet conversation. Here you'll find, along with standard tables, elegant seating in a continuous row of bronze high-back, S-curved banquettes interspersed with frosted glass screens. Regardless, most tables are laid with white linens and all with creative fish scale flatware and slate blue napkins. Go ahead and ruin your appetite with a few slices of the tasty semolina and nori bread and slather on a some of the sea salt butter. A popular starter is the rich bisque made with jumbo lump blue crab, beautifully finished with a tarragon crème fraîche. I like that the sweetness and the heavy cream normally found in bisque is missing, that the Flying Fish version is less rich and cloying. Instead it’s tart and earthy, and a tableside splash of sherry is optional. The snow crab croquettes can be hard to resist when seen on the menu, but they were overcooked and dry, although with a super rémoulade sauce. The best presentation of the evening was the seared tilefish, although it felt just a bit lacking in freshness, served over a medley of gorgeous vegetables (sliced baby potatoes, tiny florets of purple cauliflower, broccoflower, golden beets) sitting on a pool of delish potato beurre blanc, probably a nod to the old potato-wrapped snapper entrée favorite no longer on the menu. Ever popular is the char-crusted New York strip (yes, even at a restaurant specializing in seafood). But be prepared for what is a very rich dish served with sweet Onion Risotto and a heavy drizzling of truffle sauce. Equally rich but delicious is the sea bass with a heavy leek fondue and a Cassis-red wine reduction. 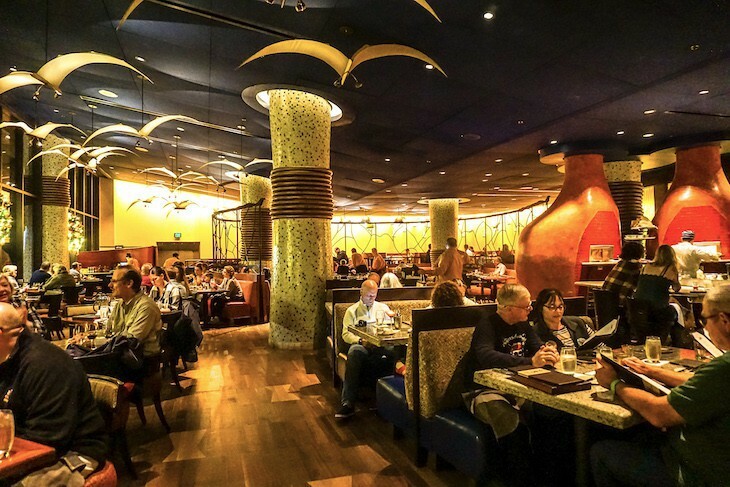 A wine list a mile long with close to 300 labels and around 80 by the glass, is quite redolent of another of my favorite dining spots, California Grill at Disney’s Contemporary Resort. You may want to arrive early at the adjoining AbracadaBar where “magic” is the theme in the variety of hocus pocus craft cocktails. Cara's Tip: If traveling solo ask to sit at the bar where there always seems to be a spirited group of diners ready and willing to chat. Poolside eatery at Disney's Wilderness Lodge overlooking Bay Lake. Lunch and dinner; casual dress. Open daily 11:00 a.m.-12 a.m. 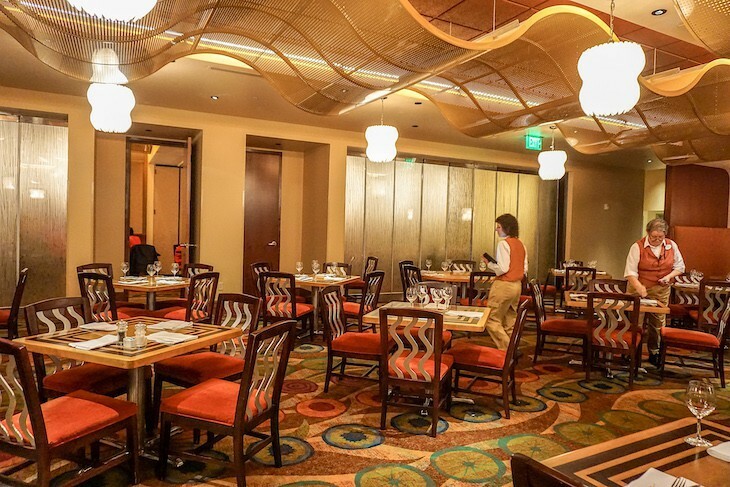 Contemporary cuisine at Disney's Grand Floridian Resort & Spa. Breakfast, lunch, and dinner; casual dress. Open daily 7:00-11:00 a.m., 11:45 a.m.-2 p.m. and 5-9 p.m. Contemporary cuisine with an African flair at Disney's Animal Kingdom Lodge. Dinner only; Resort Casual dress. Open nightly 5:30-10 p.m.
Jiko richly deserves kudos for its innovative and consistently great cuisine, seductive atmosphere, and all-South African wine list. The handsome dining room is furnished with massive mosaic tile columns surrounded by floor-to-ceiling windows, blue leather banquettes, honey-colored walls, and gleaming wood floors. Warm, contemporary lighting shaped in the guise of bird wings hangs from a rich blue ceiling, giving the feeling of open space. Giant, twin clay ovens draw the eye to the open kitchen where an eclectic blend of creations, prepared with an African flair in terms of spices and ingredients, is turned out in attractive presentations. The food veers towards the exotic, but you can’t go wrong with most anything on the menu. You’ll be impressed with the restaurant’s breadbasket of Ethiopian honey bread with its accompanying nice and salty tandoori-spiced butter. The ridiculously good Taste of Africa appetizer offers four types of exotic spreads and, you guessed it, more fabulous breads like naan, khobz, and poppy seed lavosh. And the charcuterie and cheese platter of house-cured meats of sausage and jerky with American artisanal cheese is delish with tasty sides of Pommery mustard and homemade pickles. And don't neglect to try on of Jiko's flatbreads, this last go-round topped with elk confit! Then succumb to Jiko’s oak-grilled filet mignon (perhaps a bit overhyped for $50) and its South African red wine sauce and fat grilled asparagus, but ask that it be served with the off-the-menu mac and cheese. If you are looking for a “wow” dish go for the earthy-tasting, giant-size, fall-off-the-bone tender, West African-spiced lamb shank with parsnip silk. Those who want to learn more about South African wine should keep an eye out for Jiko Wine Dinners offered at various dates throughout the year. A multi-course meal with wine pairings hosted by renowned South African winemakers in Jiko’s private Wine Room makes for one memorable evening. Call 407-939-3463 for reservations or 407-938-7149 for specific information. Pan Asian cuisine at Disney's Polynesian Village Resort. Breakfast, lunch, and dinner; casual dress. Open 7:30-11:15 a.m., noon-2:45 p.m. and 5-10 p.m. Seafood at Disney's Grand Floridian Resort & Spa. Dinner only; Resort Casual dress. Open nightly 5:30-10 p.m.
Views of Cinderella Castle and the Magic Kingdom fireworks anyone? 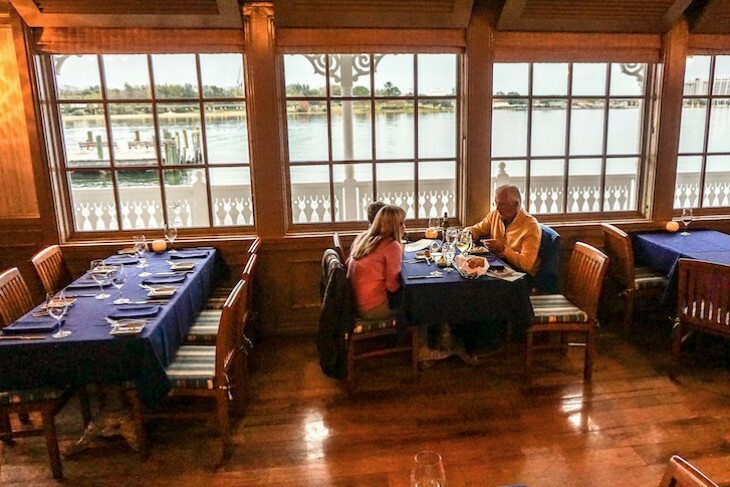 Nestled on the shore of the Seven Seas Lagoon this restaurant offers a pleasant if not exciting nautical ambience along with wriggling fresh seafood. A good start to your meal is crispy calamari made interesting with the addition of spicy pepperoncini and olives. Just wish every restaurant would make them this way! Skip the beautiful-looking but disappointing artisan Romaine wedge with its bland dressing—not sure what they were thinking here. Oh, and I’m a sucker for Narcoossee’s artisanal cheese platter with each small serving of cheese paired with a sweet little appropriate accompaniment . . . apples, olives, honeycomb, prosciutto, etc. Listed as an appetizer but hearty enough for an entrée is the barbecue-grilled shrimp and grits, a true Southern dish. Wild Florida shrimp is grilled with a tasty barbecue sauce and perched on the creamiest, luscious grits ever enhanced with pickled green tomato chow-chow and sprinkled with smoky bacon. A definite yum! You can always count on at least two choices of seasonal fish, but what is renowned here are the Georges Bank Day Boat scallops, a regular on the menu. These beauties swim in a pool of lemon- mustard jus with a mound of al dente trofie pasta tossed with beautiful grilled mushrooms and Marcona almonds, made rich with an herb crème, topped with a bit of greens: simply superb. Add a side of roasted Brussels sprouts spiked with crispy bacon and a squeeze of lemon and you’ve got the makings of a perfect meal. Known for the steamed whole Maine lobster, it’s a clever choice if you’re prepared to spring for the high price tag; at a much more reasonable price point add a ½ pound of King crab legs, when in season, to any entrée. Wrap it up all up with the sure-bet cheesecake, enlivened with a solid crust of thinly sliced almonds and a spoonful of mouthwatering Lambert cherry sauce. Of course, chocolate lovers should go for the candy bar dessert, a dark chocolate-mocha bar delight served with a scoop of guanaja chocolate gelato and a lovely smear of rich dark chocolate sauce. For a perfect culmination of your evening step outside to the restaurant’s verandah or the adjoining boat dock for prime fireworks viewing. Then stick around for an after-dinner drink in the bar and a performance of the Electrical Light Parade. Cara's Tip: Request a window table with a view of Cinderella Castle on arrival. Polynesian cuisine at Disney's Polynesian Village Resort. Breakfast and dinner; casual dress. Open daily 7:30-noon and 4-10:30 p.m.
My pick for the area’s best Italian restaurant is Ravello at the Four Seasons Resort Orlando. The updated Italian classic menu is pretty much a winner no matter what you decide to order. Honestly, I kept trying to find a dish I didn't care for, and it just didn't happen. With its stylish yet minimalistic ambience—think stark white walls, industrial ceilings, loads of wood finishes, metal dining area divisions, even a wall of stacked wood—it isn’t trying to be cool, it just is. Expect low atmospheric lighting, but don’t worry. . . Ravello accommodates with a back-lit menu and a soft spotlight at each table. And if you prefer there’s even limited outdoor seating overlooking the resort’s pool, lake, and fountains. If your table isn’t quite ready, while away the time at the restaurant’s chic bar with an inventive hand-crafted cocktail or nice glass of bubbly. 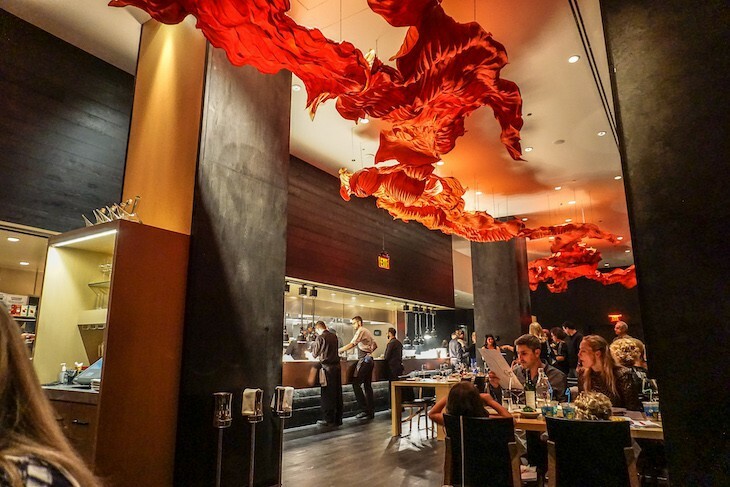 You’ll be wowed by the choice of innovative small plates. Simple but brilliant are the polpettine, luscious meatballs made with mortadella, prosciutto, veal, and beef in a beautiful fresh tomato sauce with a scoop of mascarpone to add creaminess to the dish, served with a slices of of crispy grilled bread. The mushroom salad is all it promises to be—chopped meaty portobello mushrooms, blood orange segments, fresh artichokes, red peppers, and olives, drizzled with red wine vinaigrette then scattered with crispy polenta. The capesante is a seafood lover’s dream. Two beautiful, big fat, seared scallops, each with a dollop of key lime basil vinaigrette, sit on a bed of lentils, strewn with micro greens and centered with roasted carrot strips. And Ravello’s Caesar salad is made special with crunchy focaccia croutons and white anchovies. The restaurant makes all their pasta in-house so it’s mandatory that at least one person order a pasta choice. Personally, I am captivated by the spinach and ricotta-stuffed veal ravioli. Festooned with wild mushrooms swimming in a truffled, buttery broth, it’s rich and spectacular. But let’s talk more veal . . . the vitello main dish veal is inspired by the traditional veal Parmesan, but lighter in that it is missing the gooey cheese that typically tops it. The breading is barely there, and what stands out is the flavor of the meat and the gorgeous light red sauce. Better yet are the dish’s sides of roasted fresh baby artichokes and lightly seared spinach/ricotta gnocchi dumplings. And then there’s the Mediterranean seabass (branzino), pan seared, crispy skinned, super moist, stuffed with bunches of rosemary and thyme along with slices of citrus and celery hearts (never knew celery hearts could add so much to a dish!) resting beside flavorful, garlicky Borlotti beans tossed in olive oil. Phenomenal! Seriously it’s tough to find room for dessert, but find it I did and not sorry in the least. The stracciatella tortoni, a semifreddo-like cake made with white chocolate mousse and a graham almond crust is crowned with edible flowers and bits of amaretto cookie crisp, dotted with pools of espresso fudge sauce. Phenomenal! And I always choose from the Iconoclast wines (Chardonnay and Cabernet), branded specifically for the Four Seasons as my drink of choice. 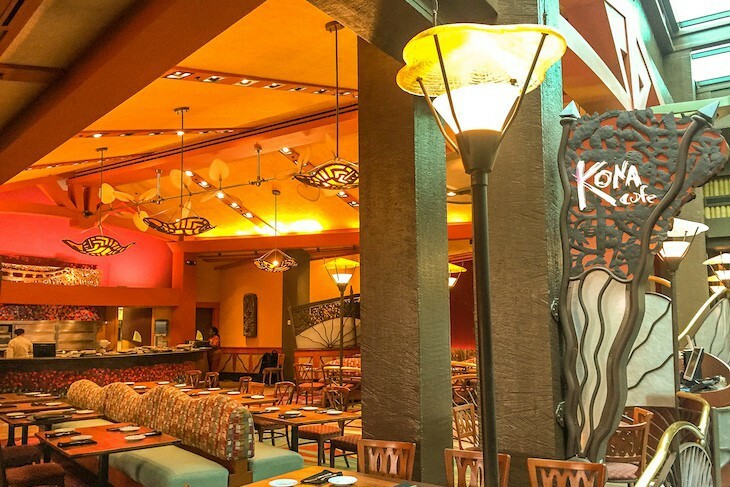 African-inspired cuisine at Disney's Animal Kingdom Villas - Kidani Village. Breakfast (quick service), lunch, and dinner; casual dress. Open daily 7-10 a.m, 11:30 a.m.-3 p.m., and 5-9:30 p.m. Character dining with Snow White, Dopey, and Grumpy in the Enchanted Forest of Artist Point. Dinner only; casual dress. Open nightly 4-9 p.m. Contemporary seafood at the Walt Disney World Dolphin Hotel. Dinner only; Resort Casual dress. Open daily 5-11 p.m raw bar and lounge open daily 3:30-11 p.m. 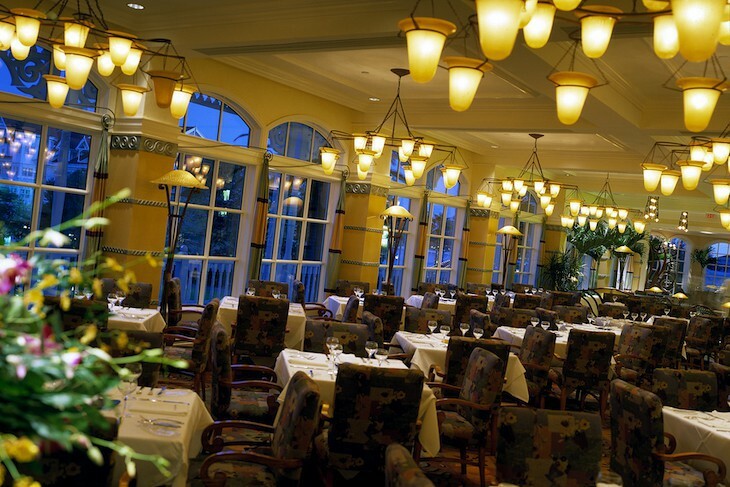 Contemporary American cuisine with classical influences at Disney's Grand Floridian Resort & Spa. Dinner only with reservations mandatory; call (407) 939-7707. Jackets for gents (tie optional) and dinner attire for women policy.. Open daily with two seating times in the dining room: 5:45 to 6:30 p.m. and 9:00 to 9:45 p.m.; July and August one seating daily, 6:45 to 8:00 p.m.; one seating only for Chef’s Table and Queen Victoria’s Room. It might be surrounded by theme parks but Victoria & Albert’s offers only perfectly refined cuisine. 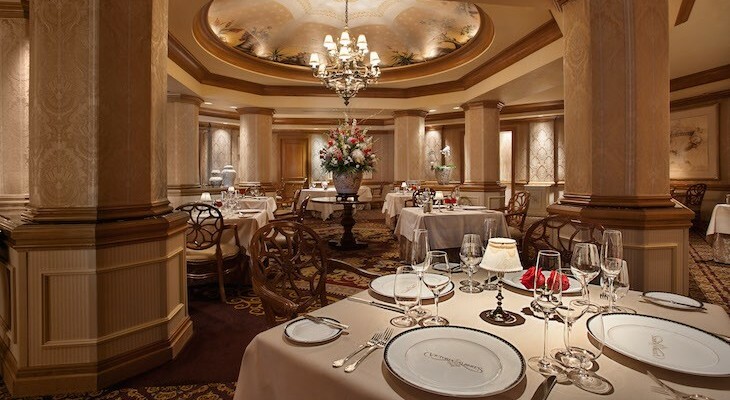 Overseen by the brilliant Chef de Cuisine Scott Hunnel and awarded the AAA Five­Diamond 17 years in a row and the Wine Spectator Best of Award of Excellence year after year, this is Disney’s true gastronomic temple. And better yet it seems to keep reinventing itself, raising the bar even higher with each and every year. Tables are set with only the finest in Frette linens, Royal Doulton and Wedgewood china, and Italian Sambonet silver, and a seasonal prix fixe menu includes six sumptuous courses, all small, served by an ultra-professional waitstaff while a harpist performs. Over the course of two and a half hours indulge in one exemplary dish after another, every morsel with its own distinct flavor, no one ingredient overwhelming another—food here is simply a work of art. And those non carnivore-eaters will swoon over the six-course, vegetarian menu, a rare find. The menu changes on an almost weekly basis so don’t ever expect to have the same of anything on a return visit, but this I can promise you, your meal will be nothing but sigh-inducing perfection. Those seeking a truly special evening should book the Chef’s Table set in an alcove in the kitchen, a spot perfect for an up-close, behind-the-scenes look at Disney’s top chef in action with detailed explanation on how each course is prepared. Or for a more formal and intimate experience with the same outstanding menu as the Chef’s Table try the Queen Victoria’s Room. Up to twelve spectacular courses are served, each more fantastic than the last. Add the wine pairings to make it a meal of a lifetime. Cara's Tip: Children under ten are not allowed so be sure to pre-book a sitter. Healthy American food at Disney's Contemporary Resort. Breakfast, lunch, and dinner; casual dress. Open 7:30-11:45 a.m., noon-2:00 p.m. and 5-9:30 p.m.
Barbecue and smoked meats at Disney's Wilderness Lodge. Breakfast, lunch, and dinner; casual dress. Open daily 7:30-11:15 a.m., 11:45 a.m.-2:30 p.m., and 5-10 p.m.
Steakhouse at Disney's Yacht Club Resort. Dinner only; Resort Casual dress. Open nightly 5:30-9:30 p.m.